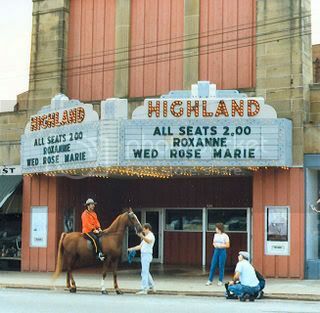 The Highland Theatre was opened on March 31, 1938 with Humphrey Bogart in “Swing Your Lady”. Seating was provided for 1,700. It was the home of stage and screen entertainment for decades until it fell into disrepair and disuse. In 2000, the theatre was rescued and restored and is now a popular art house and concert venue for this collegiate Ohio town. As part of restoration, the Highland Theatre’s interior was gutted and replaced with a new auditorium that paid homage to the old movie house’s Art Deco past. The theatre now has an expanded stage and a greatly enhanced sound and lighting system. The seating capacity has been reduced to 600. She’s not quite ready for the wrecking ball if I have anything to say about it! Please visit www.thehighlandtheatre.com or www.thehighlandtheatre.info to volunteer or just watch the grassroots grow! The site won’t be up until at least 2/10/06, but it’ll be worth the wait! If anyone wants to volunteer to help save our girl, please respond to this feed with your email address. The #1 thing movie historic movie theatres need to survive and thrive is to have access to the most popular movies (which are usually available only to the multiplexes). When we were in Akron last month, the #1 movie in America was “Pirates #3” which took in more money than the other 9 top ten movies put together. Pirates #3 was playing at the Highland, but our time in Akron was limited and I can’t report first hand how that went. Lately the Disney Company has been open minded about booking their first runs into the single screen theatres. Pirates 3 also played the best single screen houses in Baltimore (Senator), Washington, DC (Uptown), New York(Zeigfeld) and Los Angeles (El Capitan); perhaps others as well. The Theatre’s website “highlandtheatre.com) is down, but they are still showing 1st run movies as of December 2010 – the phone # at top should still be good. March 31st, 1938 grand opening ad in the photo section. The “Theater Openings” column of The Film Daily, April 9, 1938, identified the architect of the Highland Theatre as George H. Burrows. there now showing first run films! The website for the theatre says seating capacity is now 600 seats.